Hardware encoders are specially designed processors and they follow specific algorithms to collect streamable content from encoded videos. These encoders usually come in variable size ranges as portable boxes, smaller units or larger permanent type fixtures; all of them have different capabilities. The hardware type encoders are usually heavily priced and recommended for professional broadcasters. This category of encoders’ offers fixed video quality and users cannot make additional adjustments for its parameters. Hardware encoders demand much time for designing process as well as at development stage; you may often find few with older hardware components installed inside. It is not possible to get a hardware encoder for free but they can be collected at low price tag. Many advanced encoders are priced below $100 whereas few highly professional designs are costlier. Note that, as hardware encoders have fixed set of arrangements to perform encoding process so they perform with higher speed as compared to software based encoders. VidiU is able to stream data to almost every online video platform with ease and it has native integration with few popular social media networks like Twithc, Ustream, Periscope, YouTube Live etc so that users can enjoy seamless streaming with quick services. One latest addition to services is in form of sharelink and it is offered by Teradek. It is dedicated to bring a high class professional bonding service for VidiU Pro. Once users enable this technology on their workspace then it can easily combine bandwidth from various potential networks so that upload speed can be immediately boosted. 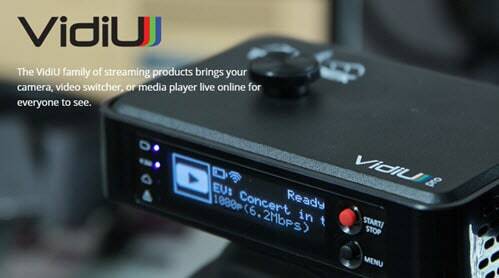 The best thing to know wbout VidiU is its cable free capabilities that allow users to monitor their live streams from remote locations using tablet or smart phones. Users can easily send data of all live broadcasts to SD card for future needs. Price: The basic version of VidiU can be accessed with payment of $699 only whereas Professional version is available with price tag of $999. Although most of their features are similar but the professional version has two additional services in form of recording and sharelink. Beam works on 5GHz unlicensed band so it can easily work up to maximum distance of 2500 Ft. It is designed to work with pristine video quality that utilized H.264 compression format and supports 15 Mbps streaming with wireless link. The frame latency of 2 is observed but when you connect beam to a LAN platform then it can offer 30Mbps streaming rate. This platform is particularly designed to meet the end requirements of professionals and it works for easy integration between all professional cameras. The best part to know is its multicast capability where users can connect about 4 receivers at a time and feeds can be transferred to numbers of destinations at a time even without losing any content or without causing any delay on network. Price: You can access the Beam package with payment of $4,990.00 and it includes both transmitter and receiver. LiveShell X assists professionals to stream live audio and video content even without using Personal Computer. 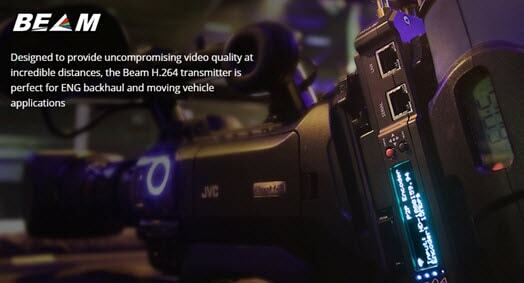 This equipment works with H.265 and H.264 encoding technology for live streams and supports 1080p resolution level at 60 fps frame rate. It is possible to do real time recording with the help of MicroSD card and it further allows use of Multicasting services while supporting three live streams at a time. This platform is dedicated to professionals with so many incredible features. Price: You need to pay $699.00 to gain access to LiveShell X. It supports next generation advanced PC less live streaming services. Users simply need to connect to their camera using LiveShell X platform and live streams can be generated from any location using wireless as well as wired internet connections. Users need not to stay connected with PC to perform this task. LiveShell X offers services for real time recording with its advanced encoding techniques. it can record data to MicroS cards directly so that users can have a backup of all streams for future needs. Further, the multi streaming facility allows fast streaming over numbers of platforms and the videos will be again saved to backup server for future needs. It keeps content always safe whether you are working on single livestream platform or using multicasting services. This software tool is maintaining log history of performance and quality in the live streamers market. Tricaster can be accessed with five different product lines and users can easily pick variable size ranges in these models. It is possible to customize software interface of Tricaster along with advanced camera setup. One can adjust controls in such a way that it matches their preferences in best possible manner. It has unlimited studio capabilities that can process professional looking content within very short duration. The collection of pre-designed template, layers compositions and various custom graphics make it much easier to setup a unique identity of brand for professionals. Price: Price range of Tricaster encoders usually stays somewhere between $5000 and$18,000 only. It offers wide range of features. These encoders extend support to HD-SDI inputs. Tricaster developers serve clients with huge variety of accessories and hardware equipments. It offers multi camera switching service where every action can be captured in simple, smooth manner with perfect angles.